Clough Cottage is an immaculate detached five bedroom period house. Originally built as a water mill and converted into this beautiful period yet contemporary home. 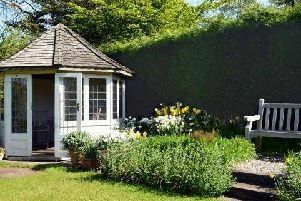 Set in a semi-rural area surrounded by superb gardens with a back-drop of wooded countryside. In addition there is an excellent workshop, garage and parking for many cars. The accommodation on the ground floor comprises of: entrance hallway with steps down to the inner hallway and stairs to the first floor; spacious open-plan bespoke kitchen and dining room fitted with a range of quality base and wall units with integrated appliances including a Smeg oven, grill and separate four-ring gas hob with extractor hood, fridge and dishwasher, solid wood floors throughout and double doors opening into the lounge conservatory; inner hallway with exposed stone archway and under-stairs storage; cloakroom; fitted utility room; lounge/conservatory overlooking the rear garden and fine countryside beyond, with exposed stonework and a beamed pitched ceiling, tiled floor with under-floor heating and a cast iron solid fuel stove; spacious games room offering a variety of options; an integral barn garage is accessed internally from the kitchen and again offers many options, it is open to full ceiling height with a cast iron stove; store room; and study with Velux window and tiled floor. To the first floor: landing; large beamed master bedroom with a walk-in wardrobe and a beamed en-suite bathroom; inner landing; three further bedrooms and a house bathroom. Steps up to another bedroom. Set in approximately 0.75 acres of gardens which encompass the property, there are excellent lawned and superbly landscaped gardens to three sides, with a pond, mature shrubs and trees, a paved patio seating area to the rear.